Welcome to the Rockdale Police Department! This website was designed to help residents and visitors of Rockdale better connect with their community’s law enforcement body. We are honored to serve such a distinguished and historically rich community. If you need us any time day or night feel free to give us a call or you can use the link to the left to report any suspicious activity day or night. Generally reports are available 5-7 business days after the accident. Reports cost $10.00. 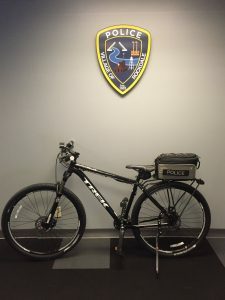 We are grateful for the donation of a new TREK police bicycle from Sumbaum Cycles in Joliet. Another way for us to interact within our community and another example of area business' that support our department and community. We at the Rockdale Police Department are very grateful for the generous donation of a fully up fitted 2016 Honda Pioneer. Donations by various local businesses made to the Rockdale Police Department over the last 6 years purchased the Honda and a donation by D'arcy Motors made the police conversion and up fitting possible. The up fitting process went perfectly and we are extremely happy with the extensive tedious job that the staff at PublicSafetyDirect did. There were many graphics revisions and complicated installation and wiring tasks that came together perfectly. We're happy that there was no cost to taxpayers due to donations and are excited to get even better connected with our residents and school district children! New Website of Rockdale Police Department! We are pleased to announce the launch of our brand new website! Our goal is to provide our Village residents and visitors an easy way to access information of interest. The user-friendly content is well-organized so you can easily navigate the site to find the information you’re looking for. The website will always be up-to-date with current and valuable information. Please be patient with us while we are still in the process of making some improvements.